Through the course of the year I always like to try and find ways a way give a little back. Be it a cake sale at school, a sponsored silence or a jumble sale there is always a way to raise funds and I feel it is especially important to include children in this. We can all get caught up in our own lives and forget about those in a much harder situation than ourselves and this awareness should be bought to the attention of our children in the hope that is will help them to become thoughtful and compassionate adults. 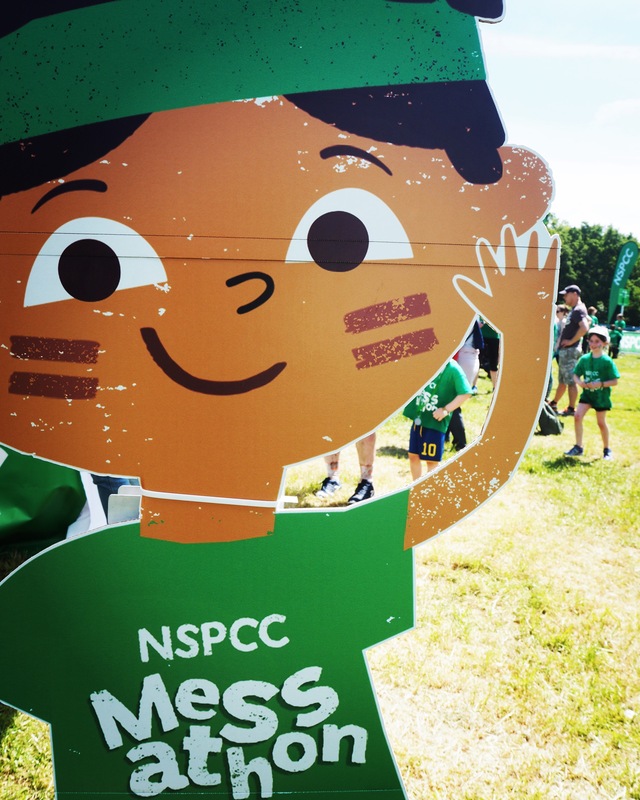 A great way to do this is to find something fun that the whole family can take part in and this is where the NSPCC Messathon is the perfect event for family fundraising. The clever people at the NSPCC a charity who’s aim is to help neglected and abused children launched their first Messathon and we were lucky enough to be asked along to take part. The event is aimed at families with competitors as young as four allowed to compete. We were up early on Saturday morning with Frankie absolutely champing at the bit to get started. Tshirts and headbands at the ready we made our way to the starting line at Frimley Park in Surrey for the warm up that got everyone going and eager to get started. The claxon sounded and each team set off one at a time to make their way around the 2.5km obstacle course. My super competitive family raced ahead to get going with the fun and I have to admit I was really excited to see what the course had in store for us. We were faced with hay bales to scale, bubbles to slide through, a water slide to plumit down, a squelchey pool of mud to wade through and so much more. It was a welcome break from the technological world that seems to take over our life so much and brilliant to have some good messy fun. It had us in fits of giggles and really bought is together as a family by cheering each other on and helping each other to overcome each of the obstacles. We bounced out way across the finish line on space hoppers to collect our medals of honour for taking part. Sufficiently covered in mud and soaking wet we stopped and grabbed a well earned bite to eat from one of the many stalls offering great refreshments. Everything has been though of at this event to made it fun and stress free to take part as a family. There were plenty of toilets and changing facilities to get out of your soggy clothes or capes to save your car from the mess if you are unorganised like us! Plenty of places to keep you entertained before and after the race with face paints and tattoos and an area to educate you a little more on the good work the NSPCC do. Or simply spend a few hours in the beautiful surroundings the event is held in. There are still two more Messathons for you to take part in this year with the first one being in Bristol on 29th July and the second in Herts on 19th of August. If this takes your fancy then I have the discount code BLOGM25 that will save you 25% on your entrance fee if you add it at the checkout. We are now champing at the bit to take part again and I would love to know of any of you decide to have a go yourselves! If you’re thirsty you fill up a glass from the tap, if you a dirty you pop into the shower, if your little one has a fall you rinse the graze with some fresh water. It’s a basic human right to have clean water and sanitation and thankfully in the UK it is something we all regularly have access to. Sadly in many third world countries clean, safe water isn’t as accessible and this has a profound affect on many people’s lives, and the tragedy and suffering it can cause has dire consequences. Illnesses such as diorreha can be fatal simply because they don’t have the ability to keep clean. For us illnesses like this are horrible to deal with but it wouldn’t even enter or heads that it could be fatal. Thankfully there is the help of some fantastic charities out there to try and help this horrendous situation with Frank Water being one of them. Because of their fantastic work Mahi Leather have joined up with them by donating $1.50 from the sale of each of their outstanding bags. They take their name from the River Mahi in India where 103 million people lack the provision of safe water. For a river that is thought to be so sacred it has bought so much suffering to so many. Through these charitable donations Mahi Leather has helped raise $7439 (up to Jan17) and wouldn’t it be great if you could help towards those statistics. Not only do you get the good feeling of making a charitable donation to a good cause through your purchase, by cutting out the middleman and buying online you are getting a hardy canvas of premium cow leather bag at a fantastic price made to order and even personalised if you wish. It was their wearable duffle bags that really caught my eye and would be perfect for carrying around all the paraphernalia that come with a large family like mine and would be a great reminder each time I filled it with bits for my children of how lucky we are and how by purchasing through Mahi Leather I have done a little bit of good. In this busy day and age it can be really hard to find the time to give to charity so by including a donation in something you can simply purchase online is a great idea that allows you to get a top quality product whilst giving back too. For anyone who know me they will know I have a huge love for Christmas! As soon as Halloween and Bonfire Night are over I’m on with the planning of yummy food, days out and pressies. All this extravagance is something I have thought about over the past few years and at such an indulgent time of year I think it is important to give a little something back to those who don’t have the luxury that some of us do, and for who Christmas has a completly different meaning or a time that they have never had the chance to celebrate. We all spend way to much on unnecessary gifts that we don’t need and more often than not never use. A lot of people already have everything they need and it is a real nightmare throng to think of something different. If you are of the same mindset as me then Oxfam have a fantastic range of Christmas charity gifts that allow you to buy a gift for someone that goes towards helping people in underprivileged countries. The gift that stood out to me was Care For Mothers And Babies that allows communities to try and get doctors, midwives and birth attendants to mothers and babies at such a crucial time in their lives. After having five babies with the security of our fantastic National Health Service I could not even begin to imagine what a experience it would be for these women who ultimately do it all alone with very little help. Purchasing this gift couldn’t be simpler. All you need to do is select your gift, add your own personal message and a little extra chocolate if you fancy and then send onto your friend or family member. I know that waking on Christmas morning with the knowledge that I have made a little impact on someone’s life will make my day that little extra special! The Pram Race in Oxted is something we were introduced to by a good friend of mine a few years ago and is now one of the highlights of our summer. Oxted is is quaint town down the road from us that started the fabulous Pram Race back in 1977. The aim of the race is to complete the three quarters of a mile course, pushing a decorated pram whilst wearing fancy dress and stopping at the seven licensed premises on the way to down a drink as quick as you can! All of this is done to raise money through sponsorship for local causes. Whist the prams are making their way round the course it was the spectators job to douse the competitors with water as they run past. 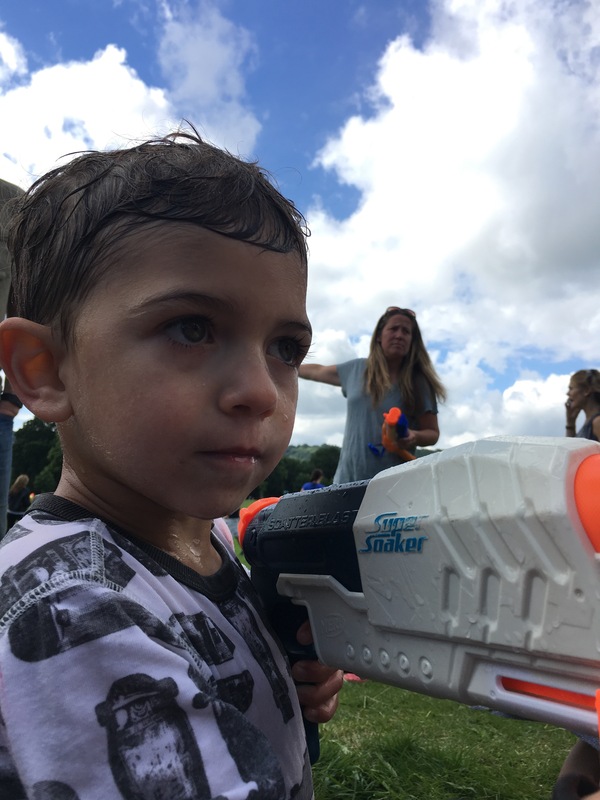 My friend is a pro at this and organised the most fantastic array of water bombs and guns that made the children’s eyes light up as soon as they saw it all! We were set up in good time to get well positioned and there were plenty of busy fingers ready to attack! The first pram came whizzing round the corner and the water started flying in every direction. The children were screaming and giggling with delight – well all apart from number five who found it all to much and spent the afternoon cuddled up cluching a water bomb. The others ran back and forth to the cart to grab water bombs and refill their water pistols. The fun continued over in Old Oxted where people were grabbing some food and drink and catching up with friends. Unfortunately number four was soaked through so we grabbed an ice cream and made our way home. This is a fantastic event that is fun for people of all ages and a great way to raise money for some fantastic causes. Now to plan some more watery ammunition for next year! When I got an email from the lovely Natalie at Cycling Made Easy asking me to pop down to try out one of their electric bikes I have to admit a little bit of fear set in! I love to ride but only in the confines of somewhere like Center Parcs where it is traffic free and lots of wide open space. Cycling Made Easy is in the middle of town so I having a few palpitations about riding on the road. The trial day was to raise money for the very worth while charity The Children’s Trust who do a fantastic job of caring for children with brain injury. Every trial that took place would mean the charity would gain £5 towards their hard work. I bit the bullet and was put at ease by the super friendly staff in store who put my mind at ease and made number five more than welcome. We were infact going to be sticking to quiet roads and cycle paths which was a great weight off my shoulders. I had no preconceived ideas as to how the bikes were going to work. I couldn’t really imagine a push bike bike with added power to it. The only way I could describe it was like your legs being given an extra boost. We started off riding the bike as you usually would then picking up speed and ramping up the assistance. I was really surprised at how much easier you could climb a hill. I felt supercharged! It would be the perfect bike to use for your commute to work or for getting the shopping as you can use the assistance to get you where you need to be without the usual strenuous ride. I have always fancied having a bike with a trailer which is really hard going to get around with. With the electric power you would be able to get along with much greater ease. If you are thinking of trying out a healthier lifestyle with the addition of some cycling I would really suggest popping in and giving them a try. I was very plesently with my ride and would defiantly consider investing when my little ones are older.